And you changed theme templates! Love the “about me” photo. Oooh, my first vote!! Thanks Brooke! I shall remain impartial to all of the patterns and not comment until the voting is in. But, now that you mention the fitting, it’s why I chose all of these patterns. None of them have fussy darts or are terribly fitted in the bodice, so fitting will be less ‘picky’. And, I did change templates and totally updated the heck out of my blog! Whaddya think? Feel free to provide any feedback. I still have alot of adding/changes to do, but I’m getting there slowly. I voted for the Cynthia Rowley. Mostly I love paisley and would love to see a dress in that material. Cool, thanks so much for voting Kat! 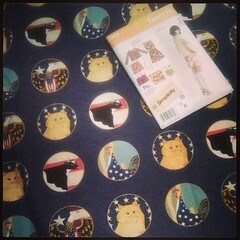 I tried my best to pair up fabric with the appropriate pattern, so hope that I made the right decision. I am one of those people that changes their mind a hundred times before I sew something, so this is a good challenge for me, since others vote, then I sew! The lines of the Cynthia Rowley dress are the most interesting. And I agree with Kat…it would be gorgeous in the paisley. The new blog look is a fantastic change (not that there was anything wrong with the old one…but a change is always (usually!) refreshing! It has to be the Cynthia pattern. Loving the waist detail. Awesome!! Thanks so much for voting, Emma Jayne! I found a little something I liked in each pattern, so will be happy with any of them as the winner. The Fabriholics Anonymous cartoon is a riot. I think they could do one just like that but about scrapbook stuff….gads, I can not resist all the new goodies. You make me laugh, you gotta love a Stormtrooper romance, hahaha. The teeny tiny Valentine is so cute. 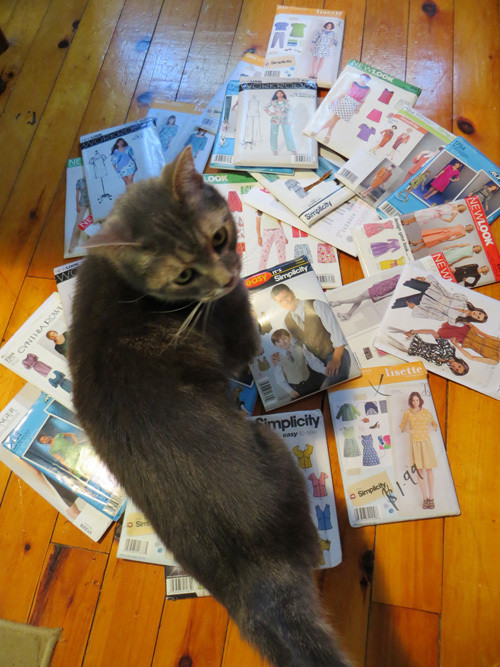 I was excited to see Kitty today, don’t you just love having company while you create your stylish couture? Blossum and Petals spend the whole day with me, snoozing on their pillow and then when they’re board, jumping up onto my Project 😀 I can’t wait to see what you decide 😀 Happy Valentines Kitty and Catja! Oh, I didn’t read your fabric description carefully enough, I though you meant just use black with contrasting white collar. But, using that black floral would be awesome in this pattern! I think those pin tucks would look nice and dainty with the tiny flowers. LOL, I had just written back to your comment (see above msg. )as I hadn’t read your description well and thought you were suggesting plain black fabric with a white collar. No fine print, ha ha, I definitely wanted input and I really like your idea of the black floral with that pattern. And, for me, Forever and a Day! 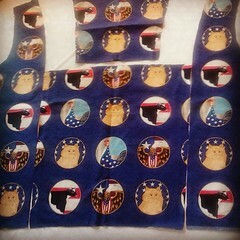 It’s astounding how many times I change my mind and sometimes end up sewing something completely 180 degrees different. That’s why I’m excited about this challenge as others vote for me and I sew the results! Secret Ballot!! The best kind. 🙂 And, Kitty asks you to please get your people to contact his people to set up an appointment for him to come over and narrow down your pattern stash. Oooh, I like that combo!! The keyhole neckline (peekabo) is too adorable, isn’t it? Thanks so much for voting! Voted! Love the Vogue 7363, it’s got great vintage-like details in a modern style. Good luck with it all! Thanks for voting Anne! Yes, it has that vintage ‘flavour’ doesn’t it? I thought you’d like that one best, it reminds me of the types of dresses you like to sew. 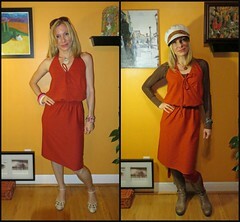 As soon as I saw the 1st fabric/pattern on the left, I wanted to see you in it!! Ohhh, you likey! I’m glad. And, it’s definitely a contender, as of today’s votes! 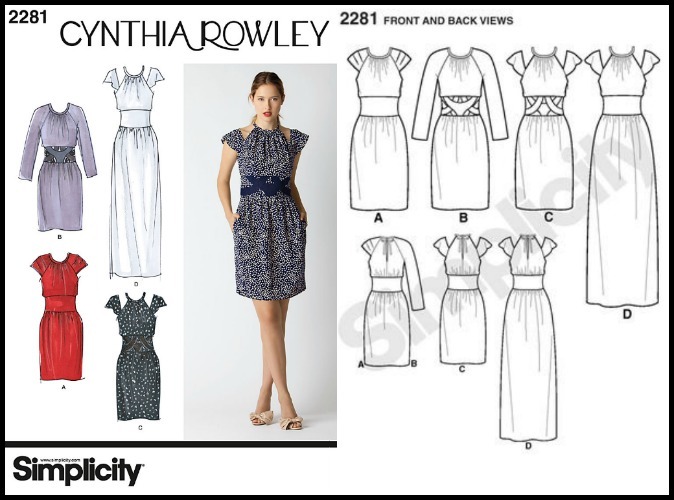 I went for the Cynthia Rowley, with sleeves up to the neckline and the great patchwork detail on the waistband. I was very charmed by the Simplicity pattern as well, especially with a V-neck and the overlapping waist-decoration! I think both would be a great choice! Yes!! See my problem??? I am constantly doing that, then end up unable to decide and sew none of them! LOL. p.s. I like the new blog look! Thanks, Kelly! I still have more updating, etc. to go, but it’s been a real blast learning how to do many of the design elements. Oooooh, I’m so excited to pop over and see Lauren’s version! I’ve been a bit behind on my blog reading this week, thanks for letting me know. 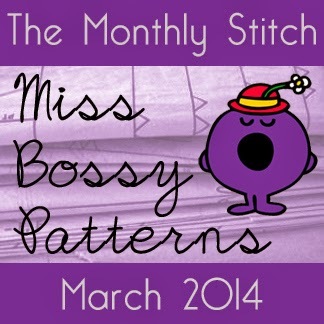 I think you should totally join the Monthly Stitch this month! I always have so many things I want to sew and don’t know where to start. Story of a sewist’s life, amIrite?? Great choices! And I love the stormtrooper graphics I voted for the Vogue 7363: my favorite version is the one on the far right. I adore that little collar and the pleats, I think that could look really great with the simple grey you have picked out or the black floral. Can’t wait to see what you make! 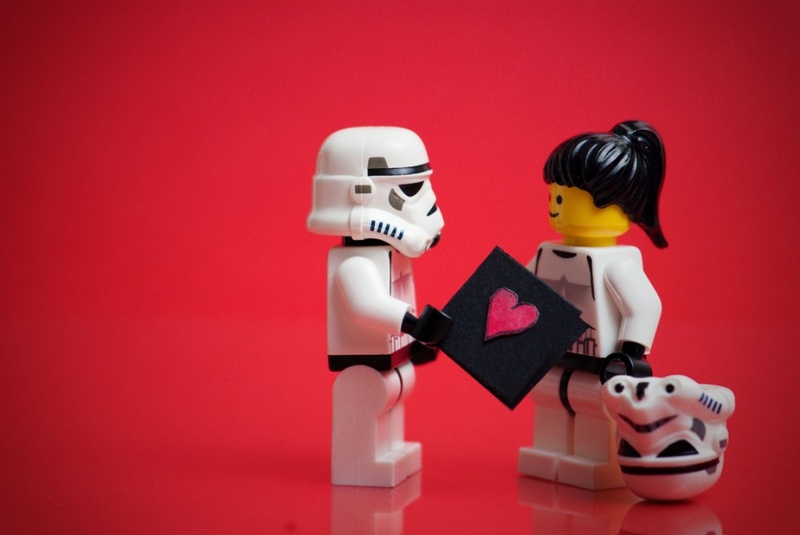 Stormtroopers need love too!! 🙂 Yes, that collar, keyhole neckline and pintucks are so fabulous. It’s funny every time somebody votes for something different, I change my mind and want whatever they are voting for! I know, I simply cannot make a decision myself. Can’t wait to see what the winning pattern is. Thanks for voting! I know it will be a winner no matter which one wins. And – you must tell us which one Kitty picks. Right? I’m going to add a ‘voting poll’ to every post from now on. I’m completely obsessed with checking the results every half hour, LOL! LOL! Those polls are fun, aren’t they? 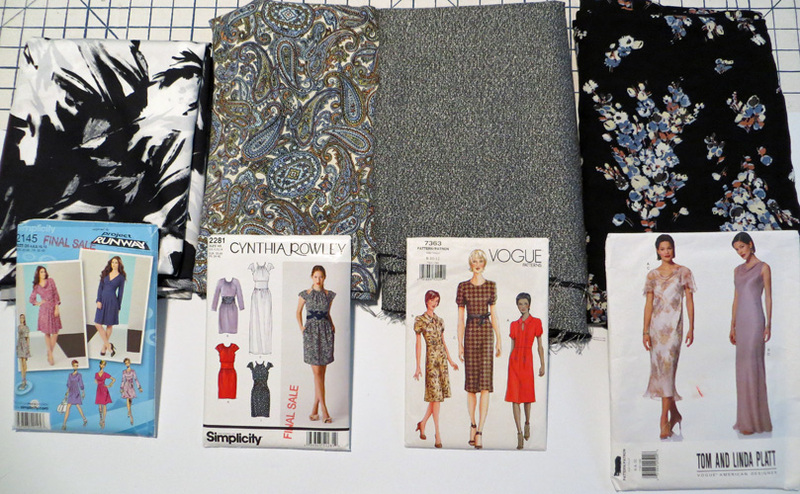 I love the Vogue pattern – the sleeves are amazing! I also love the new look of your blog – gorgeous! Yes, I do loves me some sleeve options! And, thanks Eleyna, glad you like the look of the blog!! It still needs work, but it’s been great fun ‘re-modelling’. I hope you can get the cat hair off of your fabric! Our cats found the Italian wool suiting I though I had stashed and thought it was an excellent bed. I’m using it next week and will be picking out fur with a magnifying glass and tweezers if I have too! But then again, he will be covered in fur within minutes of wearing his new pants. I can’t wait to see the results. This voting thing is actually fun. Kitty hair has become part of my life. It has infiltrated the household and is an entity unto itself. Wool would be particularly ‘sticky’ when it comes to cat fur, good luck with the removal process! I am enjoying the voting so much! I find myself constantly checking the Monthly Stitch blog and FB page to see if there are any more polls up. 🙂 Thanks for voting Annette! 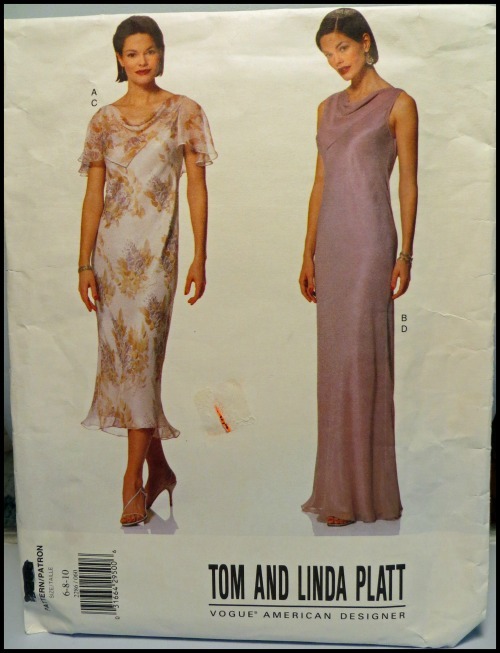 Tough choice, but the Project Runway edged out the Platt’s. (I’ve considered that one since it first came out. Just love the bias effect.) Good fabric choices. Looking forward to see the final choice. Elaine PS Good to see Kitty back, but not helpful in choosing – too easily bribed. Close call but I voted for Vogue 7363 – love the collar, keyhole and pleating combo of ‘A’. Good luck with your project – looking forward to seeing which one you make! Hey, thanks so much for voting! I’m itching to know which one will win. I can’t wait another 2 weeks! Oooh, thanks Yoshimi, it’s a lovely pattern, isn’t it? And, thanks for stopping by and voting! I love Vogue 7363 view A. The pintucks are lovely but definitely intimidate me! Can’t wait to see what you come up with! I would say yes because I can’t imagine doing those by hand! Yes, you’re right, probably a good investment. Nothing worse than wonky pintucks especially when they’re right down the front. Hi Chris, thanks for stopping by and voting! Yes, that pattern and fabric have been popular, for sure. But, I have to say, so have a few of the others. It’s definitely a very close race!! Nice! I select patterns based on that as well, because I love seeing what other folks do with the pattern and also enjoy a review of how the pattern was to sew. Thanks for voting! Good point! I like the Project Runway patterns because they tend to have so many different options. Thanks for voting Rebecca! ‘Vicarious sewing’, heh heh. I do a lot of that myself. it’s fun and surprisingly not so tiring! 🙂 I don’t even think I can wait till February 28th to find out the results….to anxious! Fabric totally dictated my pick!!! I love that first fabric! Thanks for voting! Ah, yes, fabric. Now, I do reserve the right to switch around the four fabrics with the four patterns, since it is all pretty similar drape and weight. But, that fabric/pattern match-up is what I though would look best. I am afraid I am not a tie breaker, I went for the Vogue 7363 dress because I like your fabric choice and see this as a very wearable, classic piece. If I had to be a tie breaker though, I would have gone with the project runway dress because I love stretchy wrap dresses for comfort and wearability reasons. This was a tough choice, though, all your fabrics and patterns are so nice! Oh, no worries, you need to vote for whichever one you like best! I really like that Vogue 7363 as well and glad you voted for it. I think it would be more wearable than the others as well since it has that vintage ‘feel’ but is really very classic, as you say. Thanks for voting, can’t wait to see who wins, am on pins and needles. I chose #1- Altho they are all great choices Catja. You have some nice projects waiting in the wings. 🙂 I am going to go gather mine up and see what Obi Wan chooses for me! Thanks for voting Laurie! Three of the patterns are in a very close race and it’s coming down to the wire!! Can’t wait to see who wins. Obi-Wan will be right over to vote as soon as you have your patterns up and running! I think the Vogue 7363 matches your slight vintage vibe. My 2 cents!! Cool, thanks for voting Maris! I think that dress is spot on to represent my style as well! Only 4 more days of voting, the suspense is positively killing me! Cynthia all the way! She makes such lovely patterns! Ooooh, good to know, thanks for voting! If she wins, it will be the first pattern of hers that I’ve sewn. Awesome, thanks for voting! I’ve not sewn one of her patterns yet but am excited to give it a go! The Cynthia Rowley one has such interesting detailing! I voted for that. Thank you for voting Swoodsonsays! I like that dress too. With only 2hours left to vote, methinks it will be a tie between Cynthia and Project Runway.